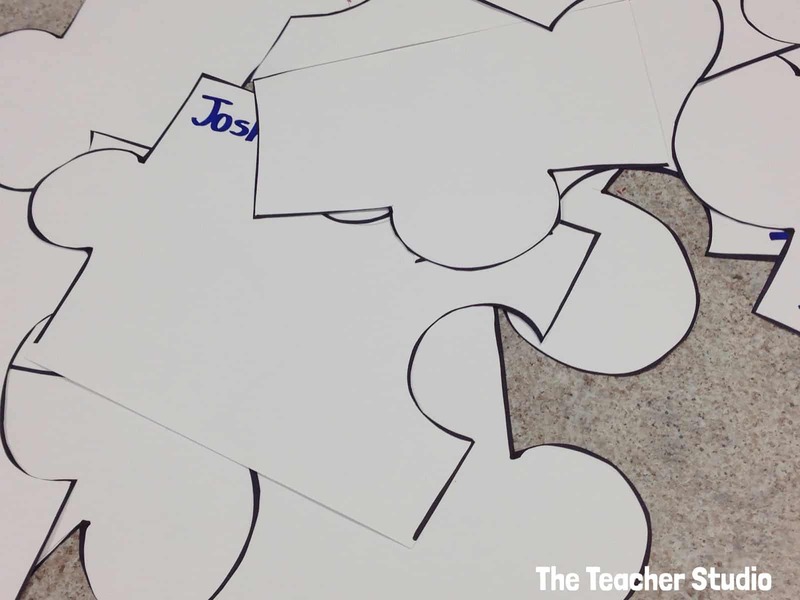 Early in the year I like to give my students time to revisit some of the work quality expectations along with a little bit of fun, and using “puzzles” has been something I have done for years! To begin, I teach a little lesson about what it means to do quality presentation-worthy work. We brainstorm a list that includes everything from using pencil before you color, cut carefully, color in one direction, draw big and bold, print neatly, spell carefully, and so on. 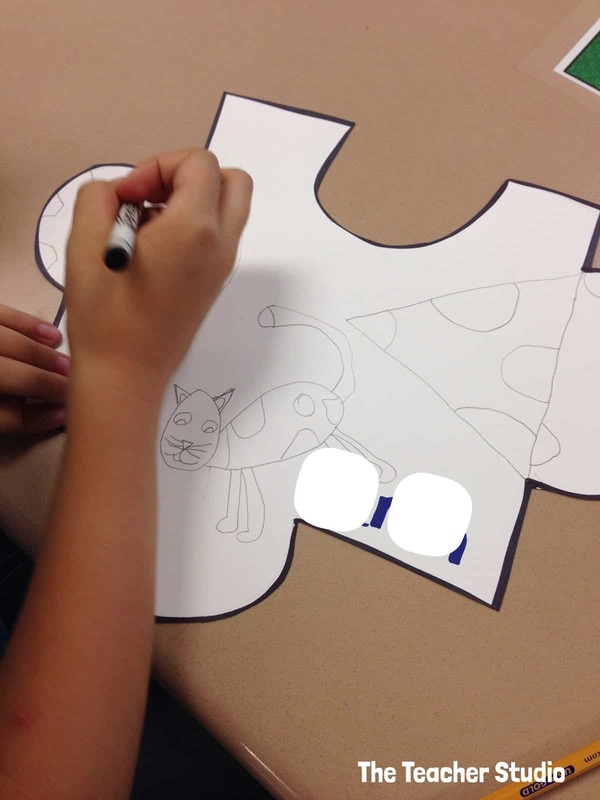 I then explain the puzzle project–that each student will design a puzzle piece that represents them…their favorite things, and so on. I explain that we will use these to get to know each other–AND to practice doing quality work! Cooperating to build the puzzle and find their “matches”! 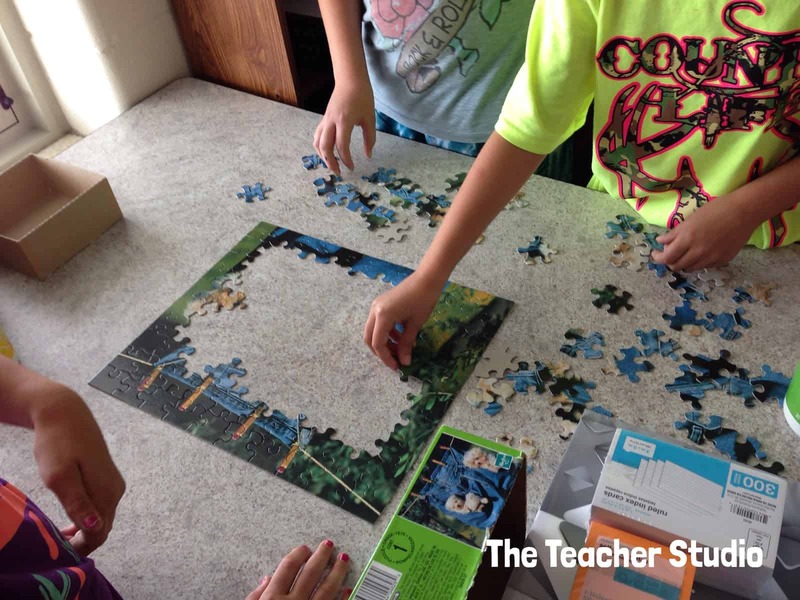 In addition to THIS project, I do another cooperative activity in the first few days related to puzzles–and then revisit the activity in January. 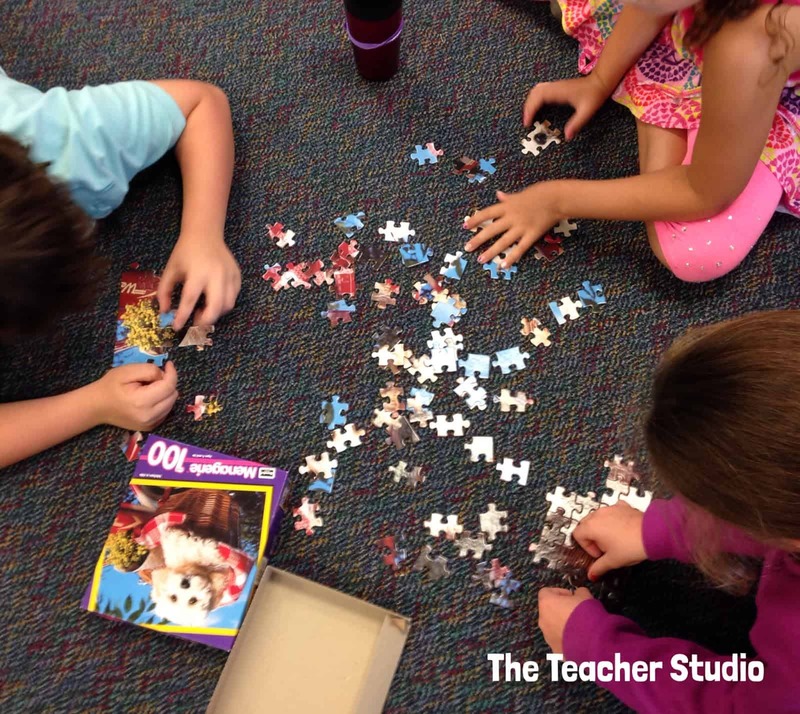 I put the students in teams of 3 to put together a 100 piece puzzle. Before they begin I ask them to talk about what cooperation should look like and then send them off to work. 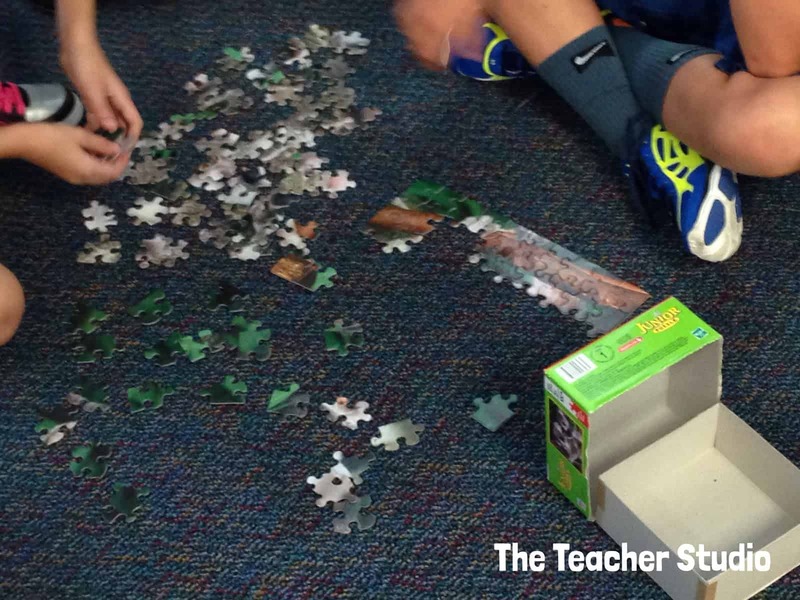 I am always FLOORED by how many students really struggle doing jigsaw puzzles. I love walking around and observing the group dynamics. This team worked SO well! They immediately agreed upon a “complete the edges first” strategy and ended up being the first group to finish. They made wonderful small talk and really seemed to enjoy the experience. 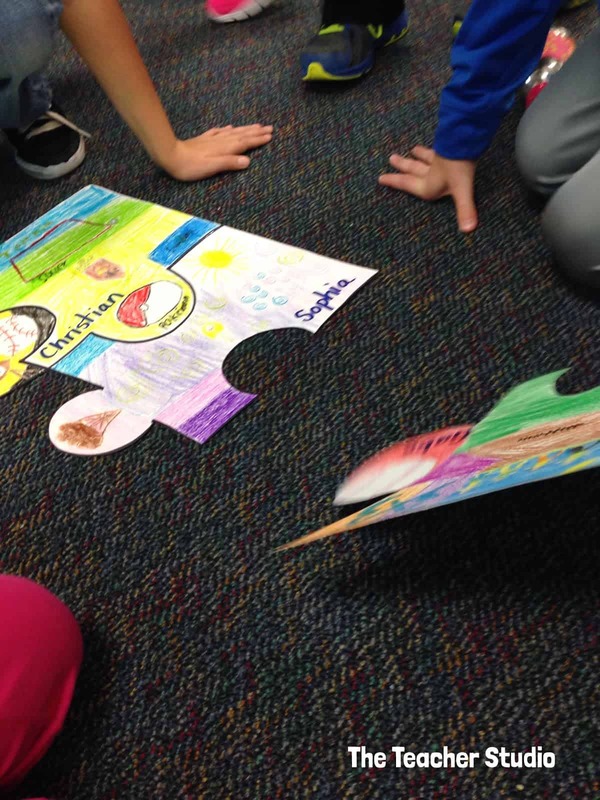 This group had a tough time getting started until one person suggested that they organize the pieces by color–and then they were on their way! Some groups were starting to get frustrated so we had a class meeting to share some strategies and encouragement and then I sent them back to work. It took different groups different amounts of time, but they all finished and it was SO much fun to hear the cheers from each group as they finished–and to see the other groups rush over to see what their finished picture was. There are so many lessons to teach besides reading, writing, and arithmetic–aren’t there?